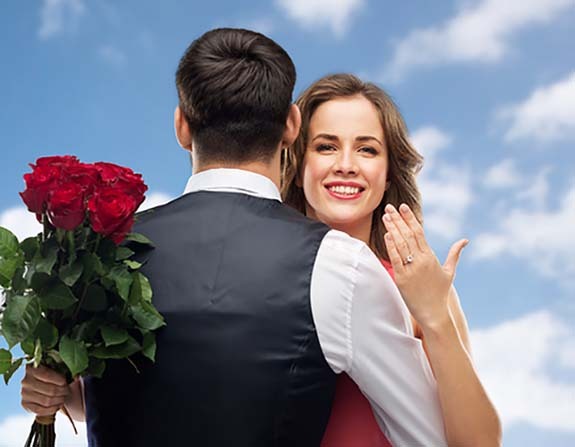 The amount bridal couples spent on their engagement rings surged nearly 56% in 2018, according to Brides‘ American Wedding Study. The surprising climb — from $5,023 in 2017 to $7,829 in 2018 — may reflect a demand for more ornate setting styles and larger center stones. Brides’ 2018 survey was designed to reveal key insights into the latest trends, behaviors and spending habits for weddings in America, based on responses from 850 brides-to-be or newly married women. The Knot, which usually publishes its bridal survey at the end of February, reported in 2018 that the average spent on an engagement ring in 2017 was $5,764, down slightly from $6,163 in 2016. It will be interesting to see if The Knot’s new stats will reflect startling upward movement, as well. • 60% follow wedding brands/products they’ve already purchased/booked.